It isn't too difficult to describe how dominant Alabama was in 2012-2013. They dominated going undefeated with factories over Michigan and Notre Dame along the way. Now after two straight National Titles the quest for a three-peat begins with the return of QB A.J. McCarron and sophomore superstar Amari Cooper. With Nick Saban on the sideline dominance should be a very regular thing in Tuscaloosa. Backfield: A.J. McCarron returns for his senior season after forgoing the NFL too win his third title for the Tide. McCarron could well be a Heisman candidate this year as he proved his ability to make smart decisions and fantastic accuracy. With a ton of talent surrounding him McCarron shouldn't have a lot of pressure on him meaning even greater strides this season. Sophomore back T.J. Yeldon should get the bulk of the carries with Eddie Lacey now in Green Bay. 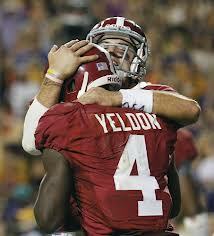 Yeldon showed his ability to elude defenders and some breakaway speed. Though, it will be interesting to see if he can have the same impact as an every down back. Freshman Derrick Henry arrives from Florida with a chance to be a game breaker when given the carries. Sophomore back Kenyan Drake should also be a factor for the Tide this season. Receiving: Sophomore Amari Cooper returns with the chance to be one of the best and scariest receivers in the nation. He has great speed and knows how to break a secondary. Senior Kevin Norwood is also back to be a target for McCarron. Although Norwood doesn't have breakaway speed nor is the most talented he is very effective. Junior stud Christion Jones should also be a very important player for this Tide offense. He has the potential to be one of the SEC's more electric receivers. If healthy senior Kenny Bell should also be a playmaker. Though with the play style of 'Bama nobody but Cooper should really get a ton of targets. Junior tight end Brian Vogler should be an important piece to the puzzle replacing Michael Williams. Offensive Line: Barrett Jones, D.J. Fluker and Chance Warmack are all gone but Alabama's line is always steady. Junior Cyrus Kouandjio has the potential to be an All-American tackle. He is huge standing at 6-6 and is 310 pounds providing a brick wall to protect McCarron. Senior Alex Steen should lead the way for Alabama's ground attack. He has proven too be amazingly effective pushing along strong and massive SEC defenders. Though this year's line isn't as fantastic as last year's historical line it should still be a big reason that Alabama wins the 2013-14 championship. Defensive Line: The Crimson Tide's defensive line should still help win the battle in the trenches even without Jesse Williams and end Damion Square. Senior end Ed Stinson should still add some pressure from the edge. Despite being 6-4, he is pretty quick and spends a lot of time in opponents backfields. Junior Brandon Ivory is the leading candidate to replace the important Williams at the nose guard position. The nose guard really sets the stage for the rest of the defense so Ivory has too be a major factor if he does indeed start there. Linebackers: Senior C.J. Mosley decided to forgo the NFL for one more year to help the Tide win another championship. He was an All-American a year ago and he makes plays from sideline to sideline. And, like most of this Tide team he is an excellent tackler. Junior Adrian Hubbard, a 6-6 outside linebacker from Georgia should also make important tackles for this team. Another linebacker, Xzavier Dickson, should play an important role in keeping this Alabama defense in great shape. There is also great depth in this linebacker core thanks to the return of middle linebacker Trey DePriest. Secondary: The Crimson Tide secondary continues to be one of the best in the nation. Shutdown defender Dee Milliner is now a New York Jet but their is still a lot of fantastic defensive backs. Safety Vinnie Sunseri is a little small but is still a hard-hitter and fits the mold of a Tide defender: gritty and psychical. Another safety, sophomore Landon Collins could have a breakout year with more snaps. 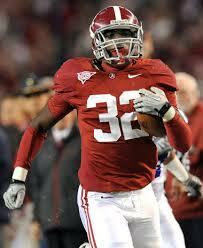 Senior Deion Belue should replace Milliner's role as the best cornerback on this team. Belue is a cornerback who embraces contact and is extremely athletic hanging with receivers down the field. Expect some good things from improving senior Nick Perry. It is time for the Crimson Tide to win their third straight national championship and fourth in five years. Maybe after McCarron graduates, some other teams might have a shot at winning the title. Or maybe this historical run of success should just keep on going.